When it comes to transfers my specialty is gel medium transfers. I make little "skins" as I have dubbed them. Basically you take a color or b/w copy and apply several layers of gel medium to the face. 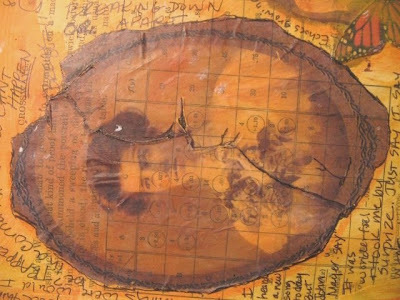 Then you moisten the paper and rub it off to reveal a thin layer of plastic (the dried gel medium) with the image from the paper embedded into the dried medium. Sounds easy, right? In theory it is. But it takes patience, practice and a steady hand. I have experimented with this process for several years, and it's some what of a signature of my work, that and the transparencies that I use. People are always asking me how I do what I do, so I had put together a little tutorial and blogged about it. In light of the Melange transfer challenge, I have reposted the blog entries I've done about transfers. The first one is about gel medium transfers and the second one is about paint stripper transfers. The finished project to the left (Eve) above is one of my favorite transfer projects and the one I submitted to the Melange transfer challenge. 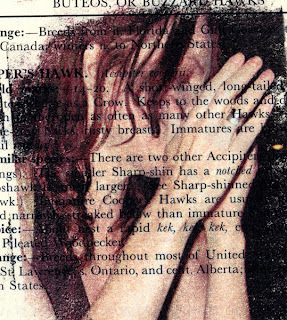 It's been great fun reading about the different methods the other members of Melange have tried- Outside of acetone transfers, and transfers from (yes) paint stripper. I am pretty stuck on the skins.... I guess when you get comfortable with something you just stick with it. 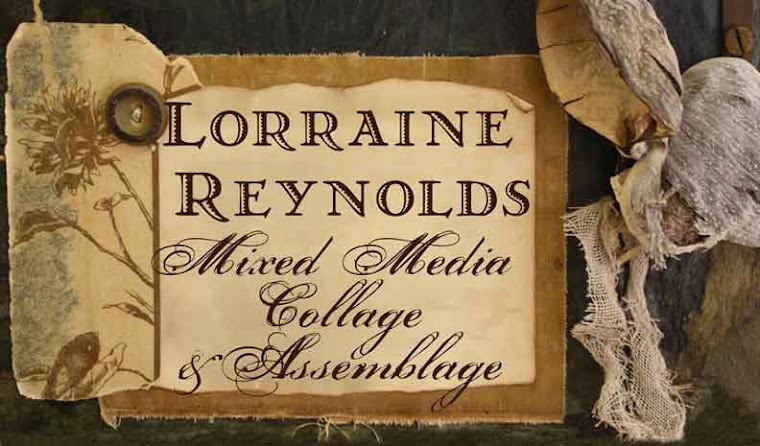 When I'm working on collages, I like to use a lot of layers. It adds to the overall mood of the piece. 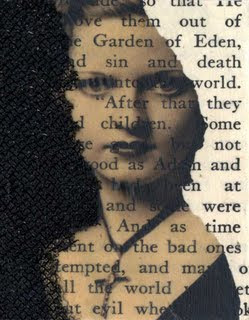 One way to add layers is using elements that are transparent or semi transparent so the pieces underneath come through- You can do this is many different ways and there are tons of books out there with different techniques. This is what works well for me- It took me a while to master this process for my own habits, so you want to tackle this, you may have to make adjustments to suite your needs. Gel medium transfers are not the easiest things to make- but for the ghostly, skin like look I want, nothing else comes close. Start with a fresh copy of a favorite image- color or black and white-copies straight off the laser printer work best for this technique. Apply several layers (how many depends on how thick you put it on.) Usually I do three or four. Remember the coats need to be even- otherwise when you start peeling off the paper- you will get stretching and tearing. Let the layers dry COMPLETELY before you apply another layer. After you have applied the gel medium- and the final layer is completely dry - you are ready to start peeling paper. This process usually takes me several nights. I lay out the copies and apply a layer or two every night while I'm working on some other project. Remember this whole thing takes patience. When you are ready to peel the paper, fill your sink, small basin or shallow dish with lukewarm water. Be careful not to make the warm too hot- lay in some of your dried gel covered papers into the bath. let them sit a while- mine go in for anywhere from 5-15 minutes for the first run. Starting in the center of the image- I roll the paper with my fingers in circular motions till it starts to pee l away. Slowly the paper will ball up and roll away and your image will appear. Keep working at it till all the paper is removed. You may have to stop and brush off the paper curls regularly. 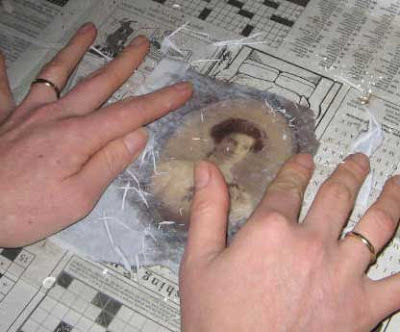 Dip the image back into the wash as needed to re-wet the paper. As the paper dries in the air it will become harder to remove. 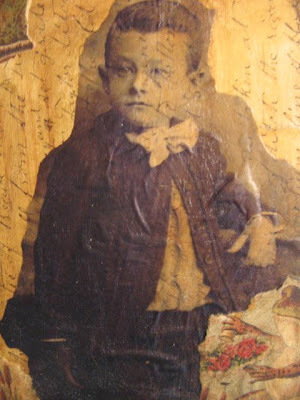 When you are all done removing the paper- your transfer is ready to apply to your collage- I cover the area that I wa nt to adhere it to with a light coat of gel medium, lay my image down and use the sponge brush to work out air bubbles. I wish you luck with this technique and don't giv e up if you fail the first time- I still tear transfers from time to time- like this one that I ended up using in my journal. EXCELLENT results with the citrus based paint stripper. 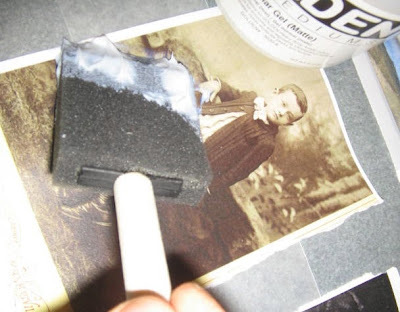 Apply the paint stripper to the image, place the image face down on the piece you want to transfer to and burnish. I used the back of an old spoon and rubbed lighty in circular motion. 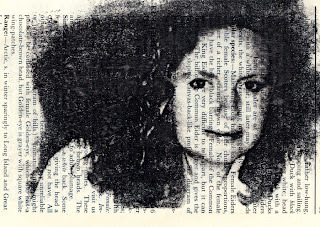 Then peel the image paper from the text paper and voila! the image is transfered. My ventilation wasn't so great. Make sure you open windows if you try this. Samples of Jennifer and Heather are attached..
every year, the week after labor day, businesses in the south end of burlington, open their doors to showcase art from all over the state. 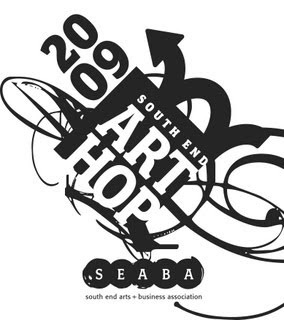 the event is run by SEABA (south end arts and business association) and this year the art hop falls on friday september 11 and saturday 12.
i am extremely honored to be curating a group show at burton snowboards corporate offices @ 80 industrial parkway. over 20 artists will exhibit their talents in a show called "off the clock." a collection of art created by burton employees when they are not at work. so, get yourself out of the cube and support local vermont artist by checking out the art hop. if you've never experienced this Burlington tradition you are in for a feast for your senses. there is art that suits every taste. there's tons of gallery receptions, live music, a juried show, activities for the kiddies and a live fashion show. Everything in my ETSY shop is on sale this weekend as park of the The ETSY street team "Melange" WEEKEND DEAL sale. Take of 15% off everything, excluding shipping. 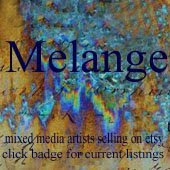 If you don't know about Melange it's a group of Mixed Media Artists on ETSY, many of who have been published. Each shop may also have additional sales of their own. I am still offering free shipping on orders over $50. The following is a list of active, participating Melange members who are participating in the WEEKEND DEAL from August 7th, through the 9th. After the item is purchased and paid for, a refund will be issued for the total discount via Pay Pal or other methods in which the payment was made. It is currently not possible to make the adjustments at payment time. Every shop, as individual as their artwork, has their own set of policies in place, so please make yourself familiar with each new shop. Check out all the fantastic deals and support the handmade nation! I've been thinking about making something for the CPS sailor's valentine challenge this weekend. so with the wheels in my mind turning I've been doing some research about what exactly they are and how I can create some with my little twist. 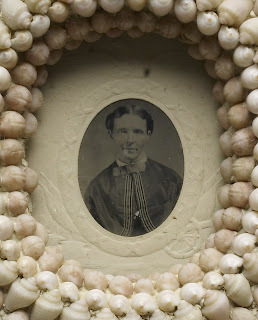 A sailors' valentine is a type of antique souvenir, or sentimental gift, originally brought home from a sailor's voyage at sea for his loved one between 1830 and 1890. 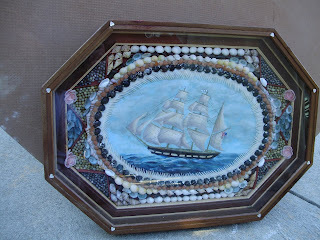 Sailor valentines are typically octagonal, glass fronted, hinged wooden boxes ranging from 8" to 15" in width, displaying intricate symmetrical designs composed entirely of small sea shells of various colors glued onto a backing. 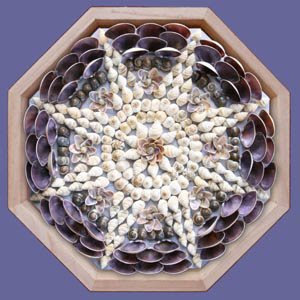 Patterns often feature a centerpiece such as a compass rose or a heart design, hence the name, and in some cases the small shells are used to spell out a sentimental message. 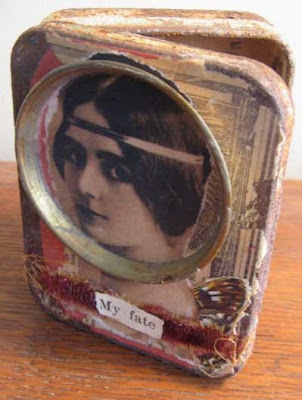 Today, antique sailors' valentines are collectibles, valued for their beauty and unusual qualities. Collector interest has sparked a resurgence in sailors' valentines as an art form, and shell kits and patterns are now sold at craft shops. Spent a few hours this weekend, surfing the web for shells and nautical bits to use with my collection on old things to construct my entry. The web searching sent me into my own workroom to clean and re-organize. Not quite finished with the overhaul yet, but I did fins me pretty pink shells that I want to work with and lots of collage paper to make into ephemera packs. I've also heard through the grape vine that Somerset Studio is doing an Alice in Wonderland theme challenge as well. I suppose I should check into that as well, especially since last weekend was our Mad Hatter, Merry Un-birthday party. Waiting for my brother in law to send over some more pix.